It seems like weeks since we all gathered. I was away in Europe on business for a week and of course the Thanksgiving holiday fell on our regular class day. I hope everyone had plenty of good food to eat. We had a traditional dinner complete with cornbread, sausage and cranberry stuffing and today the carcass has been simmering on the stove to make a big pot of soup for later in the week. Inspired by European travel and the broad cultural influence we will explore some recipes in class this week from several different countries. For starters we will taste a Manchego cheese (Spain) appetizer and move on to make a Russian Borscht (beet soup). For the main course we will prepare a crispy schnitzel (Austria – although we will discuss its origins in class) with homemade applesauce and Hungarian Beer Breadsticks (Sorkenyhenyer Palca). For dessert we will explore a lovely English Gingerbread (not like what you are thinking!) whose origins trace back to England’s Lake District with a recipe that is about 150 years old. We will also discuss the Cookie Box. Mix the flour, baking powder, and salt in a medium bowl to blend. Make a well in the center of the dry ingredients. Whisk the milk, olive oil, and melted butter in a large liquid measuring cup to blend. Slowly pour the milk mixture in the well in dry ingredients, stirring until just blended and smooth. Roll out dough on a lightly floured surface to a 10 x 13-inch rectangle. Transfer the dough to a rimmed baking sheet. Re-form the dough into 10 x 13 –inch rectangle (dough will shrink when moved). Pierce the dough all over with a fork. Let the dough rest while preparing the topping. Melt butter with oil in a large skillet over high heat. Add the onions. Cook until the onions are soft and beginning to brown, stirring frequently, about 10 minutes. Add rosemary, sugar, and salt. Season onions to taste, with pepper. Reduce heat to medium. Continue to cook until the onions are soft and dark brown, stirring frequently – about 20 minutes; cool. Spread the onion mixture evenly over the dough. Sprinkle with cheese. 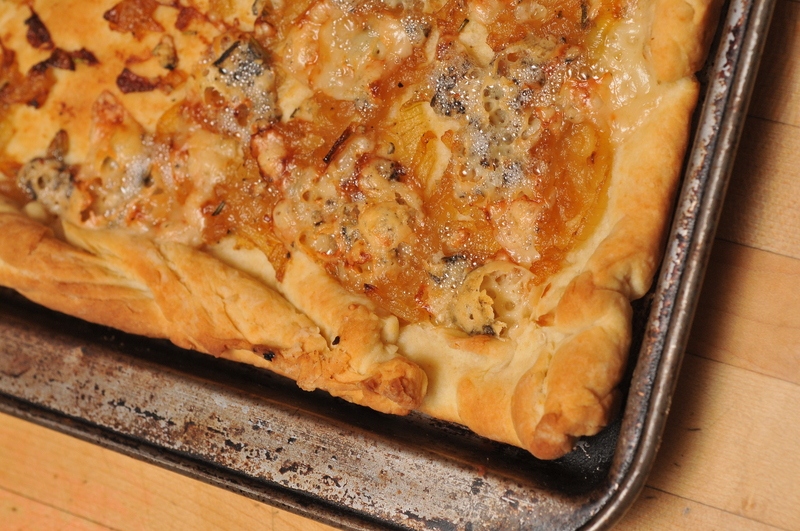 Bake until crust is golden brown and cheese is bubbling, about 20 minutes. Let cool and cut into squares. These are crisp, rich and satisfying. Heat vegetable oil in saucepan over medium-low heat. Stir in coriander, turmeric, cumin and curry powder. Cook a few seconds until fragrant. Pour in coconut milk, onions, lemon grass and red chili pepper; cook until the vegetables are tender about 7 minutes. Stir in the potato and continue cooking until tender about 10-12 minutes. Stir in the chicken, then season with salt. Cook and stir until chicken and potato has absorbed most of the liquid. Spread on a plate to cool. Unfold puff pastry sheets and cut each sheet into nine squares. Place a heaping teaspoon of the filling into the center of each square. Gather all 4 corners of the pasty and pinch together at the top, forming a small pouch. Place each bundle on the baking sheet about 1 inch apart. Bake in the preheated oven until golden brown, 22-27 minutes. Cool on a baking sheet for 5-10 minutes before removing to cool on a rack or serving plate. 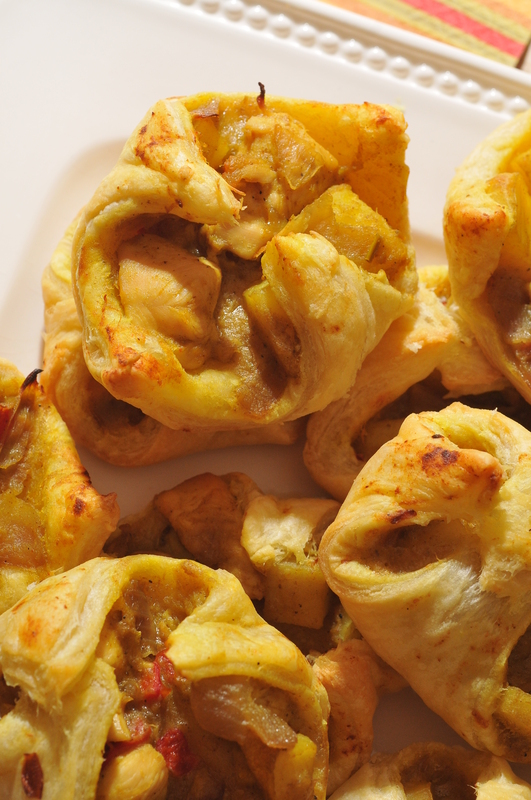 A savory bite to stave off hunger pains and they are great as leftovers, reheated. Preheat oven to 400 degrees. Lightly butter or grease a baking sheet. Put the sausage and dry ingredients into a large mixing bowl. Pour in half of the beaten egg and mix well. Unfold the puff pastry sheets (roll out slightly if necessary) and cut into 1- inch wide strips. Spread a bit of the Dijon mustard on each strip. Place a one inch mound of sausage mixture in the middle of each strip of pastry. Brush the edges of the pastry with the beaten egg and roll up the pastry into cylinders. Place the seam on the bottom of the roll. Brush the pastry rolls with a bit of the egg mixture and place on the prepared baking sheet. Bake the rolls for about 10 minutes at 400 degrees, then reduce the heat to 350 degrees and bake about 10-15 minutes more until the sausage rolls are golden brown. Mix a desired amount of Coleman’s hot mustard powder with water in a small dish or cup and mix until smooth. 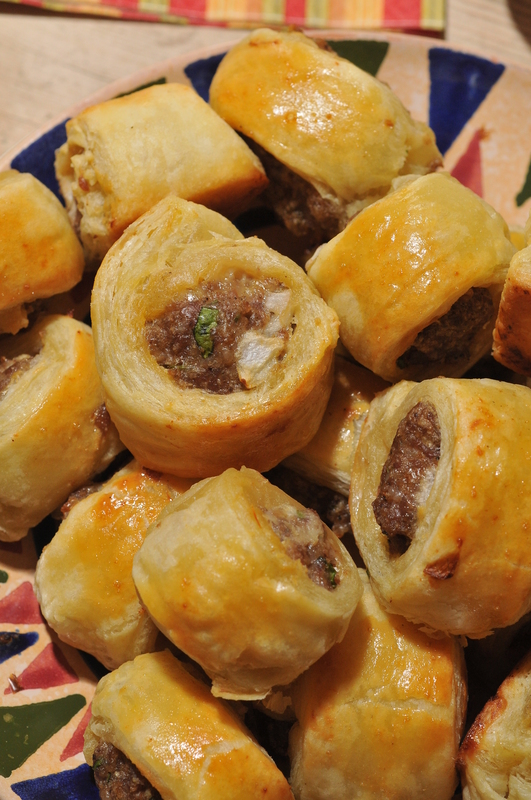 Serve with a tiny spreader alongside the sausage rolls for those who like it a bit hot! These keep and re-warm well if they are leftover. At our house they are generally eaten up while warm or snuck in before breakfast, straight out of the refrigerator. 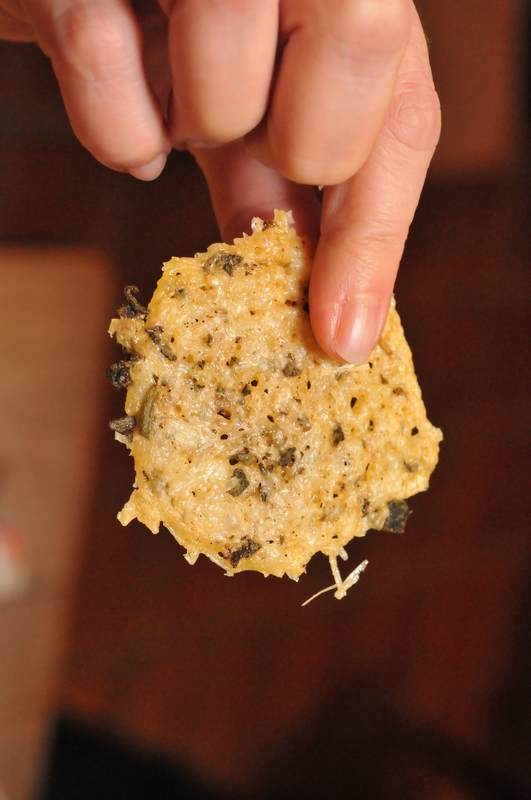 Mix together the Parmesan and sage and season with salt and black pepper. Drop tablespoons of the mixture at 2-inch intervals on a non-stick baking sheets. Pat down the mounds with your fingers. Bake in the pre-heated oven for 5-6 minutes until the mixture is completely melted and the edges are turning golden brown. Keep an eye on them as they brown fast. Remove the wafers from the oven and set aside for a few moments to firm up. They will be soft when they first come out of the oven, but will harden as they cool. With a spatula, carefully remove the wafers and arrange them on a wire rack to cool completely. Once cooled, sprinkle with the salt flakes. They can be stored in an airtight container for 2 days. What an unanticipated marriage these were...and so simple to make. 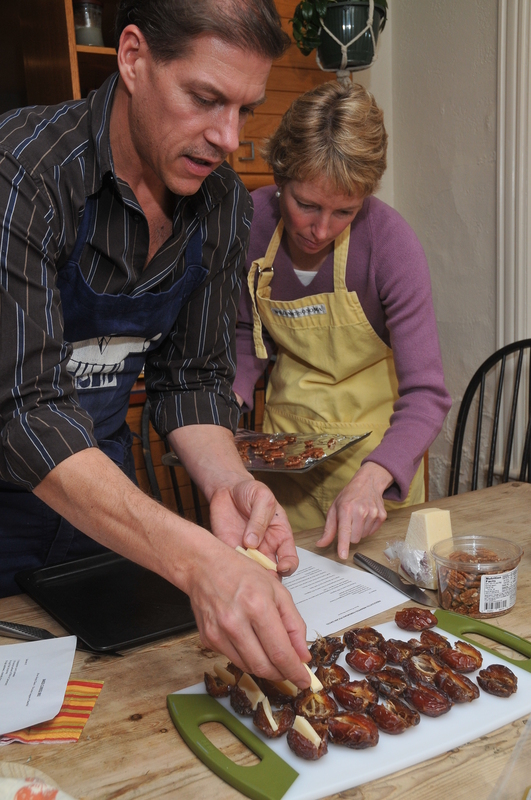 These luscious dates - are a great carrier for a savory filling. Tammy and Randall do a superb job slicing and stuffing. Place the pecan halves on a baking sheet and bake for 10 minutes or until the pecans are lightly toasted and very fragrant. Cool. Raise the temperature in the oven to 425 degrees. Make a slit along the top of each date. Cut the parmesan cheese into thin slivers. Stuff a parmesan sliver and a pecan into each date. Quarter each slice of prosciutto into 4 long slices. Wrap each date with a strip of the prosciutto. Place the dates on a baking sheet and bake for 5-6 minutes until the prosciutto is crisp and the Parmesan softens. Transfer dates to a plate and finish them with a fresh grind of black pepper. Serve warm or at room temperature. 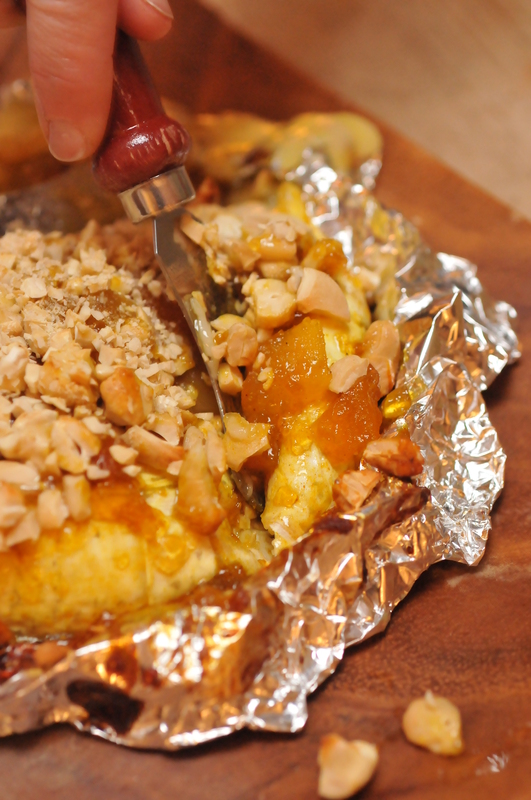 Although the baked Brie is a fairly standard presentation – the addition of the curry with the chutney and almonds makes this satisfying dish a bit warmer and special. Enjoy with fresh slices of bread while it is warm! Sprinkle the curry powder over the cheese. 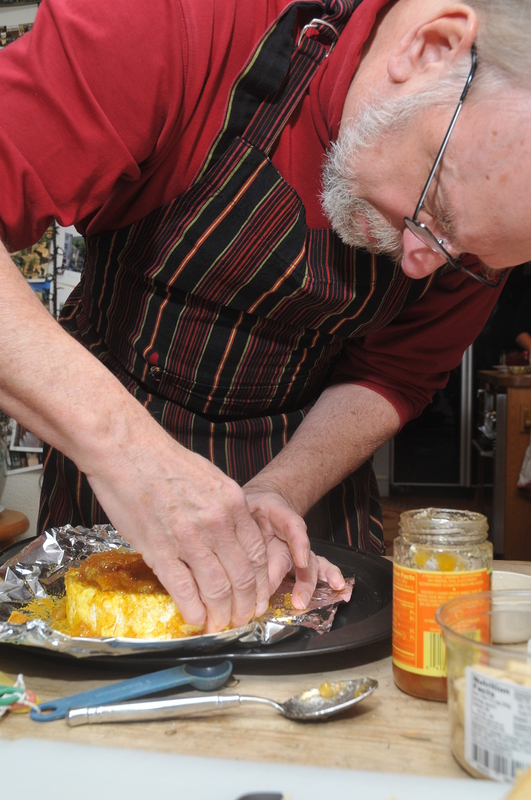 Using your fingers, rub the curry powder into the top and sides. Spread the chutney evenly over the top and sprinkle with cashews. Gently press the cashews into the chutney so they adhere. Bake 7 to 10 minutes. If cheese is cold when placed in oven, add 5 minutes to the cooking time. Transfer to a serving platter and surround with baguette slices or crackers. Make sure and eat this when it is warm and soft.